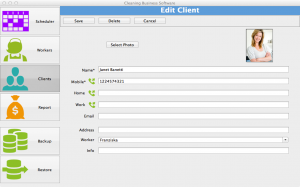 Cleaning software for Cleaning Business is yet another powerful program designed specifically to be used on Mac (OS X). Like any other services business, cleaning jobs require proper documentations pertaining to job scheduling and employee management along with several other similar activities. 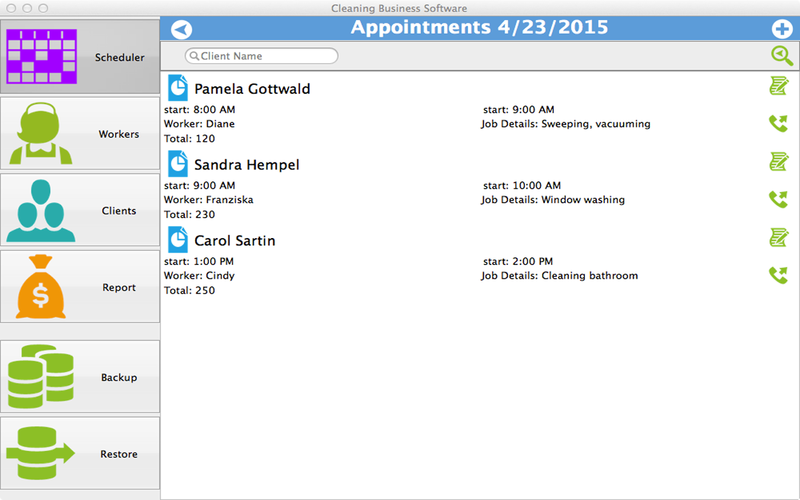 Cleaning Business Software allows users to record and later view all information related to the different jobs performed such as carpet care, window washing, floor care, etc. The program also allows users to store all information about employees including appointments and employments of past present and future jobs, custodial training etc. The different features of the program allow instant access to information of clients, workers, appointments and total earnings. Instant access to such vast information not only facilitates business operations but also ensures efficiency which is the backbone of any growing business today. 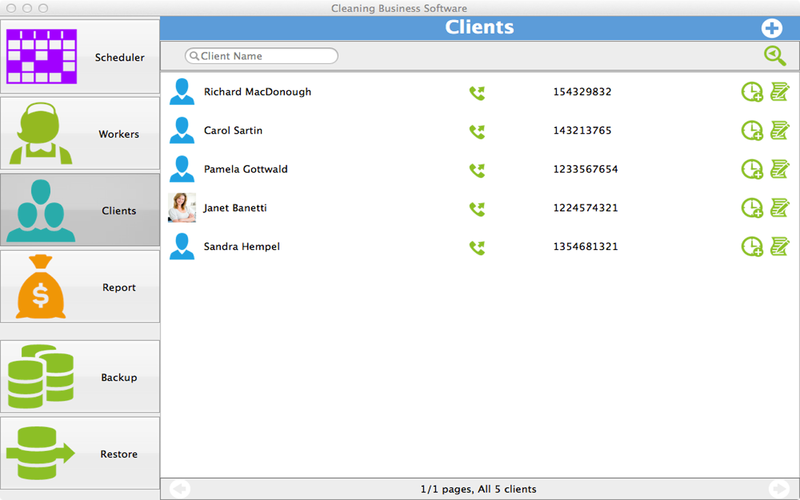 The Cleaning Business Software offers a simple and easy to use interface through its effortless main menu depicting four distinct icons each contributing significantly towards managing your business in an ideal manner. 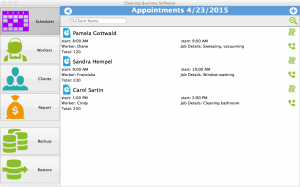 Workers, Clients, Reports and Scheduler, the four functions in the program sum up the progress of your business. The Workers section allows creating of a separate profile of each employee with their names and job description. 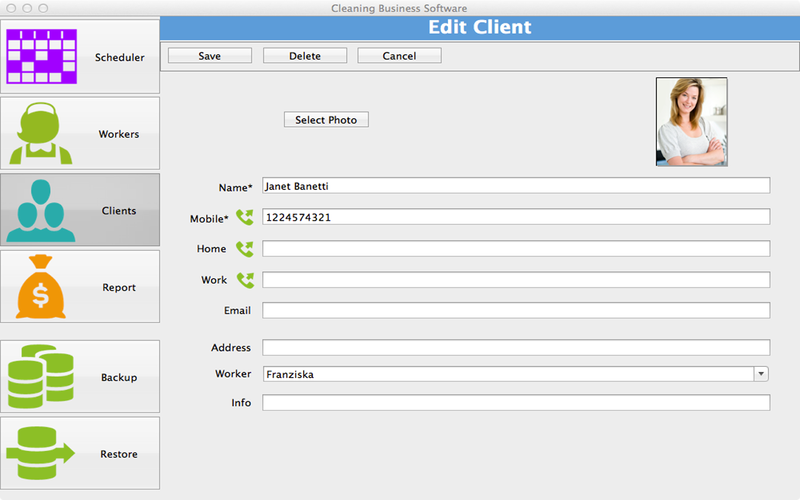 Each worker can create a personal profile and list in all their daily engagements for easy access later on. Viewing these profiles, appointments of a particular person based on his expertise can be fixed instantly, saving a lot of unnecessary communication time. The profiles of the workers can be selected easily through typing in either the name or the job type required and instantly all related search results will be revealed. The Clients section similarly holds all record related to clients including personal and contact information along with all previous jobs’ histories. Not only can you save in the email, mobile, home and work phone numbers along with the address, but you can also capture photos of the clients if you want and save it with their profile. An added advantage offered by the program is that it allows the option of calling in directly to any Skype account, making communication with clients much easier and offering them extended customer services. The Reports section can be used to add in any extra information related to a job or appointment for further referral in the future. This can be in form of any special directions for a workers, some special request from a client, or any other such note. The Scheduler section opens up in form of a calendar that shows not only the daily accumulated earnings over each date, but also helps in instant checking of available time and date to fix appointments. 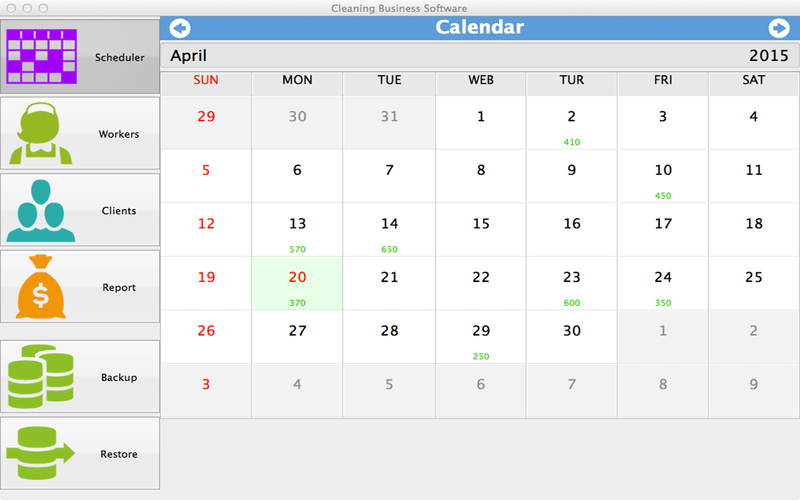 Clicking on any date will reveal all related information including appointments, job details and earnings.